Welcome to Down On The Street, where we admire old vehicles found parked on the streets of the Island That Rust Forgot: Alameda, California. Today we're going to head over to the former Naval Air Station Alameda, where the Enterprise, Coral Sea, and Carl Vinson have been replaced by companies that make movies and absinthe. While the ex-base (now known as Alameda Point) is miles wide, it doesn't have many streets intended for parking and hardly anyone lives there full-time. That means the DOTS pickings aren't as good as the rest of the island, but I was still able to find this daily-driven '65 Comet parked near the old Officers' Club. 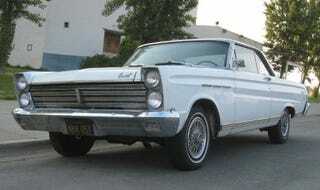 We've already seen a 1965 Comet in Alameda (the Bechtle Mercury), but that was a bottom-of-line 202. The Caliente, on the other hand, was the luxury version of the Comet, selling for $2,352 versus the $2,108 that penny-pinchers shelled out for the 202. Keep in mind, however, that the mechanically identical Ford Falcon coupe was just $1,977. The real dilemma facing car shoppers looking at a small Dearborn product back then was this: the '65 Mustang coupe sold for $2,372, nearly identical to the Caliente's price tag. Which would you have purchased? Standard engine on the Comet was the slow-but-dependable 200-cube inline six. Give the Mercury dealer some extra cash and you'd roar out of the showroom with a 225-horse Super Cyclone 289 in your Comet Caliente, and of course it goes without saying that you'd want the 4-speed as well.